All of our nursing homes offer exception care and encourage freedom of choice and independence for residents in all areas of daily life. 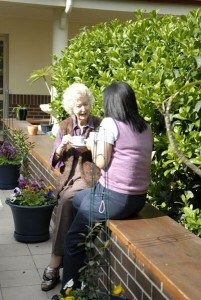 We believe that a residential aged care home should be as much like a resident’s own home as possible. With that in mind, we respect the dignity of each and every resident. Our innovative monitoring systems ensure that all residents have programs tailored to their individual needs. Those with special care needs, including dementia, are provided with specific care to ensure they are comfortable at all times. We encourage family participation and offer support to family and friends. Each of our centres meets the needs of their local community. Columbia Aged Care Services is committed to recognising and respecting the cultural diversity of all of our elderly residents. Our aim is to provide the best care possible, taking into consideration the culture and linguistic needs of our residents. Columbia Aged Care Services is leading the way in continuous improvement systems. We are proud to say that our Aged Care Accreditation Standards surpass the Australian government standards in many areas. One of the ways we can achieve this standard is through extensive ongoing consultation with residents, families, staff and all other stakeholders. Our highly trained staff continuously undergoes education programs to develop skills in current health and care practices. We offer both individual and group exercise programs. Individual specific exercise programs are undertaken by trained staff in consultation with each resident’s General Practitioner and our Physiotherapist. The aim is to achieve short-term results and enhance quality of life through beneficial exercise. The group exercise program has achieved outstanding results through the careful planning and assessment process and caters for all residents. Trained staff members implement the group based program, which focuses on wellness rather than frailty and illness. The program offers residents the chance not only to improve fitness, but to socialise and enhance their general well-being. Each of our residential aged care nursing homes offers a variety of social and recreational activities. Activities are arranged five days per week, Monday to Friday, with individual activities on Saturday and / or Sunday in some facilities. These activities are not compulsory, but are arranged for your enjoyment should you feel like joining in. We have a wide range of activities available for residents, from in house individual activities and events, through to taking residents out to community events and activities. The events are publicised in our regular resident newsletter, the Columbia Gazette, and our monthly activities program, titled “What’s on This Week”, which is placed on the notice boards throughout the facility and given to each resident so they can choose the activities they would like to attend. Bus outings are available and community programs outside the facilities are also arranged. Our 22 seater bus is fully air-conditioned and has electronic wheelchair access. Lots of interesting attractions are visited weekly, including annual trips to Bowral for the Tulip Festival and the Easter Show. The local libraries visit each home and we also have our own extensive library of large print books, audio cassettes, CDs, DVDs, videos and talking books. All special occasions are celebrated. You can let our Diversional Therapy staff know of any special events you wish to enjoy. Residents are encouraged to achieve a maximum degree of independence as a valuable member of society. We encourage community groups to come to the facility and provide community contact for all our residents and we take residents on outings to community events as much as possible. There are active resident and relative committees in all facilities and these often have educational components included, such as dealing with a stroke etc. We welcome your ideas and your feedback, as they are very important to us. We have been caring for a range of different cultures in our centres for many years and we appreciate that residents living in residential aged care nursing homes live in a multicultural environment. Our aim is to cater to the cultures that are most common within our homes. At the Acacia Centre (Marrickville) this is the Chinese, Greek and Portuguese communities, at Willowood (Chatswood) this is the Chinese community and at Strathdale (Strathfield) the Russian community.